One of the consequences of being a cocktail blogger is that I receive press releases from PR people for lots of other spirit companies - several a week. And often they are for companies that only make products in the same categories that we do. It's not like I hide who I am or what I do for a living. Do they really think I'm going to write about that Russian vodka? At least I know what they're up to, I guess. This week, I've received several with ridiculous suggestions for cocktails for the 4th of July holiday. In every single case, they suggest that we use an imported spirit for the cocktail. Really, for the celebration of American Independence? We should use imported vodka (from Poland, or even (gasp) England? ), tequila, gin (from England again), or absinthe (France)? I think a proper 4th of July cocktail should be made with an American-made spirit, perhaps influenced by what was popular back then. For what was popular back in the day, I'd go with RUM. A great American-made rum. I'm reading And a Bottle of Rum right now, so I've definitely got rum on the brain - and I know it was quite popular in that era, although it became scarcer once Britain stopped letting us import molasses from the islands. As for other ingredients, I'll probably use what's in season, and what is common to the USA. Or maybe I'll go Tiki - an American phenomenon, after all. Or maybe back to cocktails from the 1770's, or with an American whiskey drink? Next week I'll report with some recipes for 4th of July. In the meantime, anyone have any suggestions or ideas of what you'll be drinking on the 4th of July? Please share - as long as it doesn't call for tequila or imported vodka. I'm participating in the group blog for all things Tales of the Cocktail again this year, and my first post, about Mixologists and their Toys, is up on the blog. Be sure to keep an eye on the group blog for the lowdown on this year's festivities! And for anyone who doesn't know, Tales is happening in New Orleans from July 8 - 12, and all the cool cocktail aficionados are going to be there. Won't you join us? I got a very exciting email yesterday from none other than Dr. Cocktail himself, Ted Haigh. His 2004 book, Vintage Spirits & Forgotten Cocktails, was one of my primary inspirations for getting into cocktails and a frequent reference source for me. I've made almost every drink in that book, and have recommended it to many people. Unfortunately, it's been out of print for awhile now, and copies were going for a pretty penny on eBay and Amazon. Well guess what? An updated version is coming out on July 1st! And Dr. C was kind enough to include some notes about a bunch of us cocktail bloggers in the new edition, so yours truly will be mentioned in the book. This is much cooler than being immortalized in a hypothetical in a law school textbook, which is my only other known appearance in a book. I haven't seen it yet, but I would highly recommend checking it out - I will be! 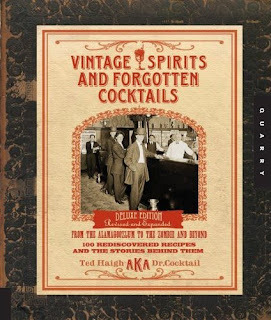 You can pre-order it on Amazon here: http://www.amazon.com/Vintage-Spirits-Forgotten-Cocktails-Alamagoozlum/dp/1592535615/ or ask for it at your favorite book store in a couple of weeks. This month, Rum Dood is hosting Mixology Monday and the theme is ginger. Long story short, I love ginger and we use it in lots of cocktails. One of my ongoing favorites is the ginger gimlet that I blogged about a couple of years ago (using a 2:1:2/3 ratio these days). Lately, however, I've been playing with ginger and our award-winning Aquavit. Aquavit is an under-appreciated spirit in our book, and it's something that we love. For those who don't know it, the dominant flavor is caraway seed (that's the definition these days, anyway - gin is juniper, aquavit is caraway). It's up the distiller to decide what else, if anything, is used. Ours is made with caraway seed (the required element), cumin, coriander, cardamom, cinnamon and anise, and then aged in new American oak. That combination of spices plays spectacularly with ginger. Without further ado, here are a couple of favorite cocktails with ginger and aquavit. I'm afraid I'm running out of time to get my MxMo submission in by midnight, and it's been a long day, so I'm going short and sweet this month (but hey, at least I'm getting in a post!). Combine Aquavit, ginger syrup and bitters over ice. Top up with club soda, stir briefly and garnish with orange slice. Shake ingredients with ice; stain into chilled cocktail glass. Garnish with an orange peel rose. As you might expect, I've only tried these with our aquavit, but I expect it might work with others. Cheers, and thanks to RumDood for hosting this month! We were in Colorado recently for our nephew's graduation from high school. Suffice to say, we did not have much time for cocktail adventures due to family commitments, but we did manage one trip to a couple of places in Boulder. Our favorite by far was the West End Tavern, which was recommended by a friend of ours. While there, we saw this cool gadget on their back bar, holding fresh basil. The bartenders said it extends the life of the basil for several days - basil is a notoriously short-lived herb, but is also a great addition to certain cocktails. This gadget is called the "Herb Savor" and is made by a company called Prepara. They have some other cool stuff on their website, especially this "Power Plant". Well, this post is now way overdue so I better get on with it before I forget what happened! Here are a few of the highlights from my cocktail drinking adventures in San Francisco in April, beyond the Tiki drinks I wrote about last month. I tried to cram a lot of bars into a short amount of time, with so much to see and so many great people to meet. I didn't get as many places as Rick over at Kaiser Penguin, but I did pretty well considering that I often was driving and had other commitments during my visit. Although I don't have pictures of them from this trip, I really enjoyed seeing Neyah White the cocktail genius at Nopa again, and hanging out at The Alembic again and meeting Daniel Hyatt. I also had the pleasure of meeting Jonny Raglin at Absinthe and having lunch (and a fabulous cocktail) there (and my own personal autographed copy of Jeff Hollinger's book too). After a light dinner and cocktails at Alembic (one of our friends had never been there, so we went again) we headed to Heaven's Dog. Lucky for us, we found some blogger friends there, as well as Erik Ellestad and Thad Vogler behind the bar. Great drinks again (I only had sips since I was the driver), and fantastic food. I got to try a new (to me) absinthe, Leopold Bros.
At right, a shot of Camper English, cocktail and spirits afficionado and writer extraordinaire, at Heaven's Dog. When it was closing time,Camper took us over to Beretta, which we closed down as well. 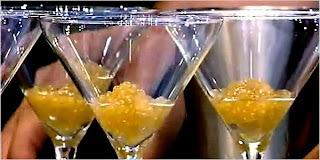 At Beretta, my most memorable cocktail was the Single Village Fix with smoky mezcal, pineapple gomme syrup and lime. I noticed many mezcal cocktails on menus, and also many with gum/gomme syrup, so I hunted down some Small Hands syrup to bring home. On my next free evening in the city, I stopped in at the Clock Bar to meet Marco Dionysos and try the Chartreuse Swizzle that I'd been hearing about. It was really busy, so I enjoyed my drink then continued my adventure. It was a short walk to Cantina, where I met Duggan McDonnell, and found our friend Gabrielle Barnes behind the bar. Gabrielle was one of the first people we met when we came to San Francisco a couple of years ago - she was working at Bourbon & Branch then, and when we asked where else we should go for great drinks, she recommended Nopa (sit at the bar). We had an amazing time there with Neyah behind the bar. This time around, Gabrielle had just returned from the Mixology Summit, and made me a great cocktail with Black Seal rum, Grand Marnier, and Cynar - she didn't have a name for it, but it was a fantastic drink. Gabrielle is competing in one of the cocktail competitions at Tales of the Cocktail this year, so I'll be cheering her on there. Wrapping up the night, I stopped in a Dosa on Fillmore, and had the Bollywood Hills made with Subrosa's Saffron-infused Vodka, as well as a nice little cocktail made with our Distiller's Gin No. 6. The cocktails (menu designed by Jonny Raglin) were great, and so was the Dosa Masala (yum).